Karen & Rei’s sits back off the road on Route 9 in Clermont, NJ about two miles from the turn on to Avalon Boulevard. They moved here 9 years ago from their previous home in the heart of the Avalon beach town. We had heard some great things about this hidden gem and all 9 of us were anxious for a great Saturday night meal. I will admit that the men in the group might have been a tad preoccupied that our 8PM reservation coincided with the kick-off of the Eagles – Dallas playoff game in Texas but, John B. was getting constant text updates from his son so we weren’t far away from each tidbit of bad news. 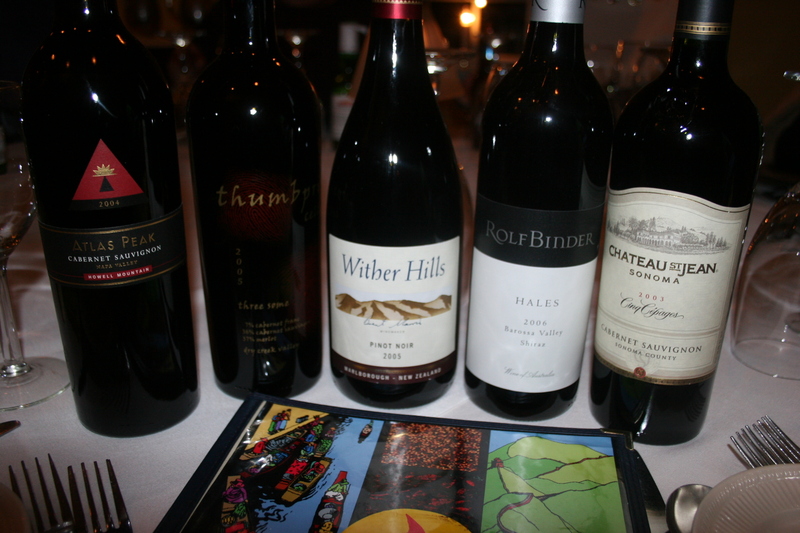 The wines for the evening were discussed in an earlier post but as a refresher we had the Thumbprint, the Cinq Cepages, the Atlas Peak Cab and the Wither Hill, Pinot Noir. All excellent wines. We were seated at a nice round table affording us the opportunity to chat easily with anyone in our party. Most of the chat was about the football game but I was able to multi-task and focus on choosing an appetizer. 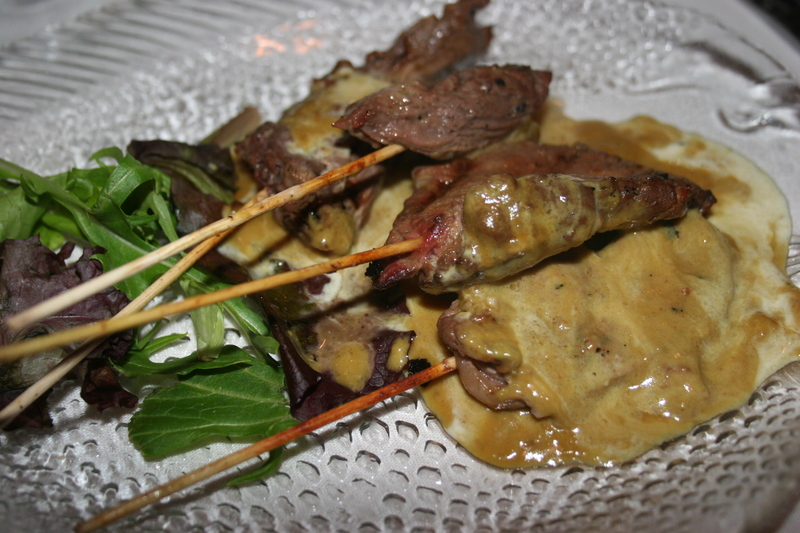 When Gerry B. chose the Beef Satay I decided I would like the Shrimp and Crab Boudin, a delicate sausage made with a blend of shrimp, jumbo lump crab meat, scallions, fresh dill and rice; roasted then served in a light sherry cream sauce with diced tomatoes. I thought it sounded great! In fact, it did sound great. Unfortunately, it now ranks as possibly the worst appetizer I have ever half-eaten. 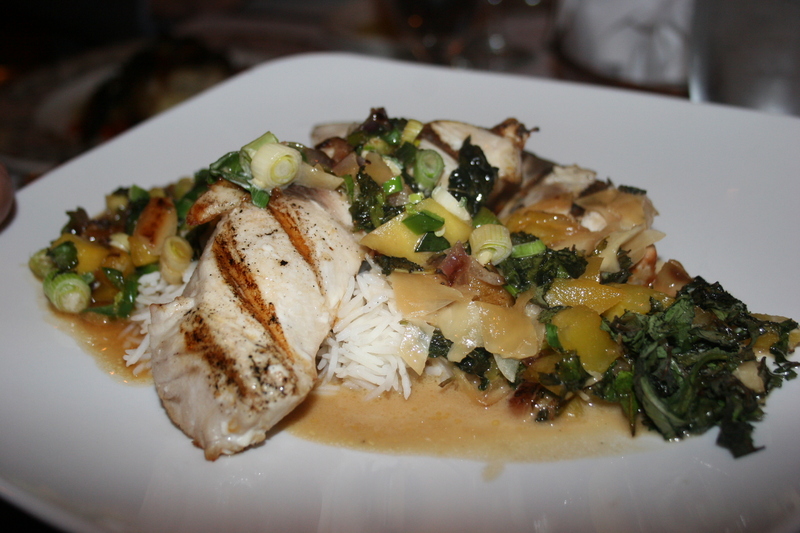 I mentioned in the previous review on my chicken entree at Sorella Rose that it lacked flavor. In retrospect, that chicken had tons of flavor compared to my Shrimp and Crab Boudin. In order to make sure that I wasn’t missing some subtle culinary magic I offered some to a few of the others. They all concurred that this item was totally lacking in any redeeming value. I even checked with the waiter to make sure I had received the correct item. 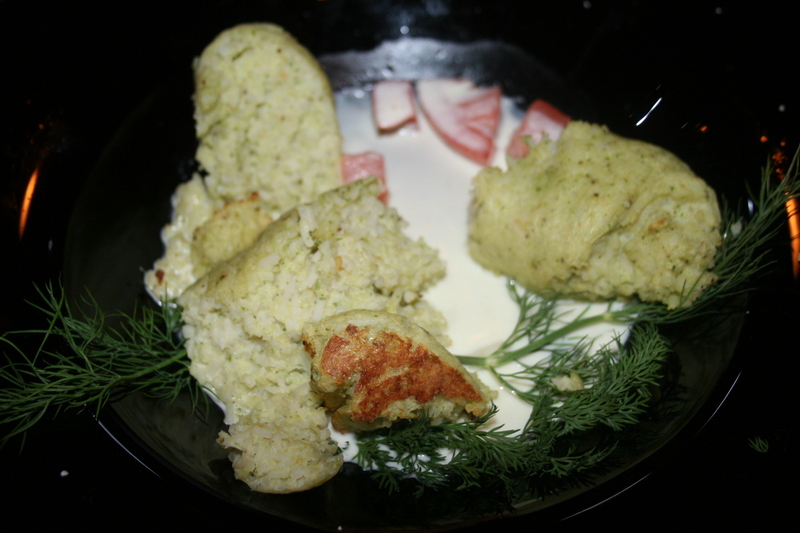 He assured me that the concoction on my plate was, indeed, the Shrimp and Crab Boudin. Fortunately, we fared better with the entrees. There were a lot of interesting fish offerings on the menu for that night. The “Specials” Menu tempted with Walu (Hawaiian Butterfish), Australian Baramundi and Grilled Pacific Ono. All of the women chose one of the fish entrees. There were no complaints from any of them as each was nicely seasoned and served over a bed of basmati rice. 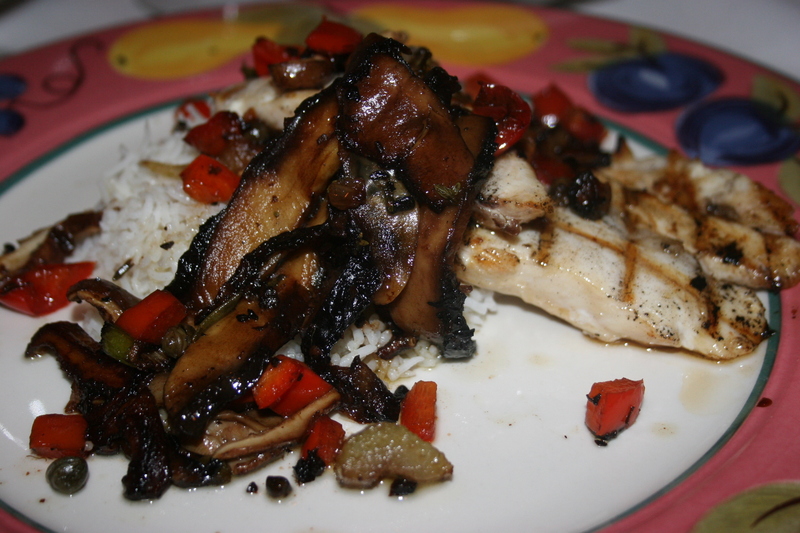 It was readily apparent that Chef Karen knows what she is doing with fish. 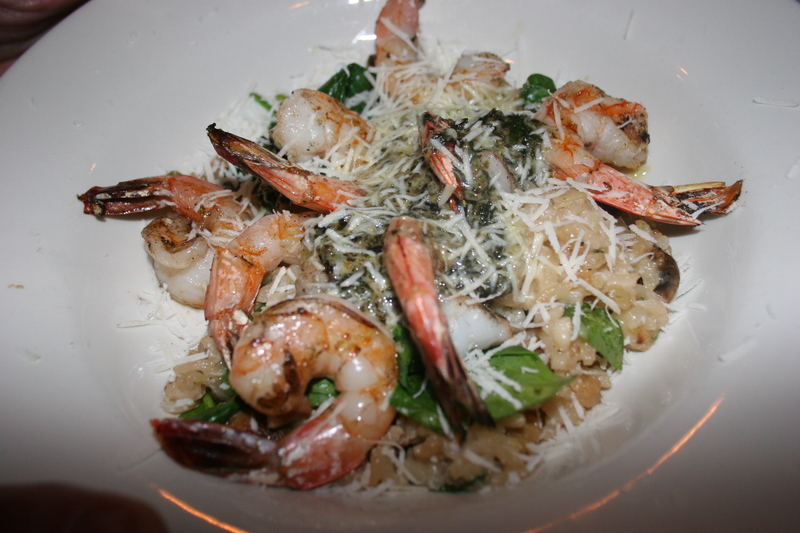 Gerry B. made it two consecutive nights of shrimp and pasta as he chose the Spicy Shrimp Grand Marnier , seared shrimp with ginger, shiitake mushrooms, jalapeño and fresh orange zest, deglazed with Grand Marnier and honey over angel hair rolled in fresh basil. That was some combination of exotic flavors and Gerry enjoyed it on a par with his meal from the night before. 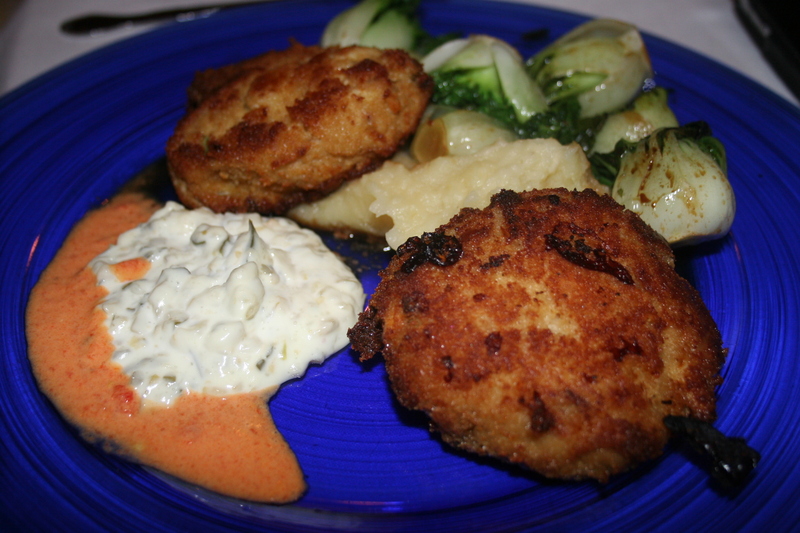 John B. couldn’t resist the Maryland Crabcakes, dusted with breadcrumbs and served with a roasted sweet pepper coulis, tartar sauce and roasted garlic mashed potatoes. He said it tasted every bit as good as it sounds. As for myself, I was anxious to find proof that chicken could taste delicious and therefore chose the “Original” Grilled Chicken Avalon. 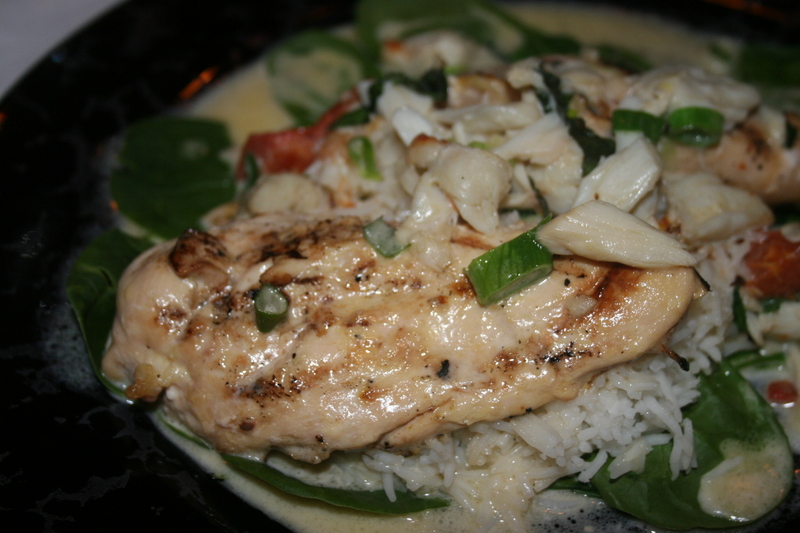 Marinated chicken breast over basmati rice pilaf and fresh spinach, garnished with jumbo lump crab meat, simmered in a toasted garlic and basil beurre blanc and finished with tomatoes and scallions. The dish restored my faith in chicken. It was very good. Karen & Rei’s features a huge dessert menu but the guys were itching to get back to Avalon for the second half of the Eagles-Cowboys debacle. Had any of us known just how bad the game would be, we would have certainly made the decision to stay for dessert. Karen & Rei’s is open all summer and on weekends during the winter.